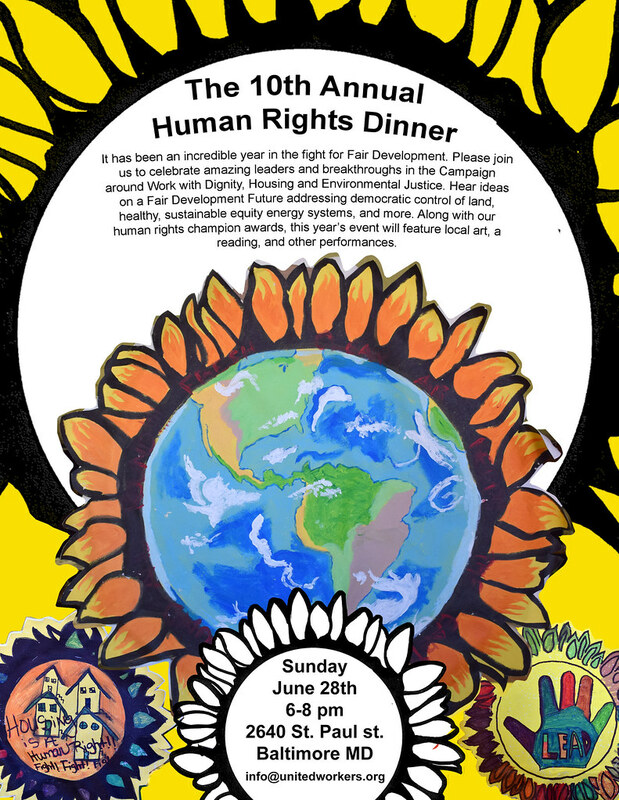 Please join us to celebrate amazing leaders and breakthroughs in the Campaign for Fair Development including Environmental Justice, Work with Dignity and Housing. This year's dinner will include a special performance of "Holey Land" a collaboration between local artist Valeska Populoh and youth leadership from Curtis Bay that tells the story of economic and environmental devastation and the community vision for a future that values equity, sustainability and health. In Addition, Destiny Watford, student leader from Curtis Bay will be doing a reading on the key lessons learned from the front lines of the fight for Fair Development. We will also showcase over 50 hand made sunflowers that were part of a parade to highlight the fight against what would be the nation's largest trash burning incinerator permitted to be built next to Benjamin Franklin High School and Curtis Bay Elementary School. So get ready for a great night of celebration, performance and reflection... and great food!